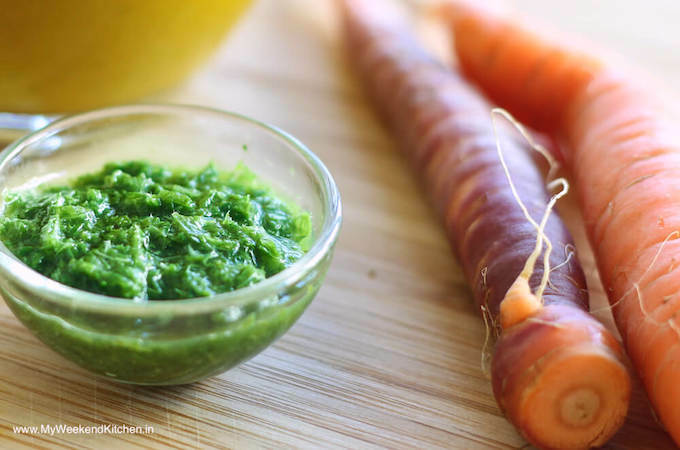 5-ingredient, delicious and super quick carrot top pesto. It is so perfect that I add it to my soups, my salads and also on my toast. I wonder why do we not get carrots with their tops always! Recently, I saw carrots with their beautiful green leafy tops in the summer vegetable market in Bucharest. I had never cooked with carrot greens but I thought if they are selling the carrots whole, we surely can eat every part of them. (Later I also checked and yes, carrot tops are edible and actually very nutritious!) I tried a leaf right there. It has a distinctly earthy, slightly bitter, sharp and (not surprisingly) carrot-ish flavor. 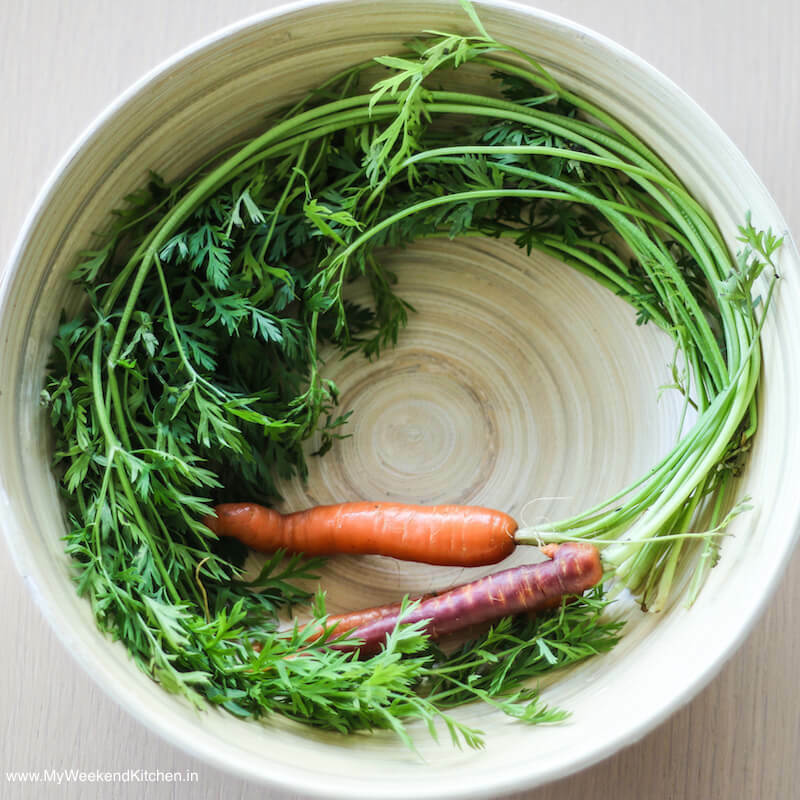 Carrot leaves have 6 times more Vitamin C than the carrot root! They are also a good source of Vitamin K, which is actually not there in the root per se. They are rich in Potassium and Calcium. It is the high amounts of Potassium in the carrot leaves that gives them a slightly bitter taste. Potassium helps control osteoporosis, lower blood pressure, and promote healthy metabolism. The greens are rich in chlorophyll, which is an excellent source of magnesium. Magnesium promotes healthy blood pressure, strong bones, and muscles. Walking back home, my mind was already coming with ideas on different ways I could possibly eat the carrot greens. Sprinkle in salads like other fresh herbs or try a pesto and if all fails I can simply add them to my vegetable stock. 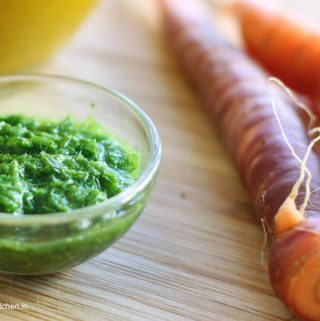 5-ingredient, delicious and super quick carrot top pesto recipe. You can add it to your soups, salads, and also spread on toast. It stays well in the refrigerator for upto a week. Thoroughly wash the carrot tops under running water and chop roughly. The stems at the end were very hard so I kept them for stock and used only the soft part of the stems for the pesto recipe. Combine all the ingredients in a food processor or blender and pulverize to a smooth consistency. Add more olive oil if required. Check the seasoning and use the pesto with anything. Stays good in an airtight box in the refrigerator for up to a week. Nutritional Info is approximate information for 1 tbsp carrot top pesto. It is definitely a delicious addition to salads and soups. But I was more thrilled about using the carrot tops for the first time. In India and also elsewhere most often I have bought carrots without their green leafy stems.. so this was a wonderful experiment :-). Thanks for this and idea. I purchased some carrots with gorgeous leafy tops and didn’t want them to go to waste. I tried this and it’s delicious! Yes Carrot leaves are so delicious to be wasted! 🙂 I am so glad you tried it and loved it!